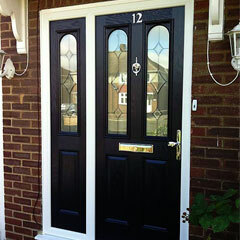 Are you looking for a new front door for your home? Would you like to have French doors or bi-fold doors at the rear of your property? 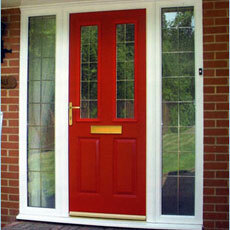 From front doors and back doors to suit any property. Our doors are available in aluminium, composite and UPVC and are built to last, offering excellent longevity and excellent security for your home. Whether you are reflecting the existing style and period of your home or want to create a new image, Aluminium Doors, UPVC Doors or Composite Doors offer an attractive solution and are available as double glazed or triple glazed options. As well as meeting the standards for the “Secured by Design” police initiative and the BSI Kitemark, we have incorporated the latest security features into our UPVC door designs. Our UPVC doors are made to the same high standards as our windows, which make sure they're built to last and last. What's more, they're available in a wide range of designs and finishes. Whatever you're looking for to make the perfect entrance to your home, we're sure to have it in our huge selection! Our UPVC door frames are available in a wide choice of colours and finishes, so you certainly won’t be stuck for choice when looking for that perfect style! Using over 27 years of experience in the industry, we've made sure there's something to go perfectly with any home, whether it's a traditional cottage or a modern semi. Our double-glazed doors are a popular choice among our customers, who love them for the reliable, secure and attractive finish they give their homes. Why not get in touch for a quote? You might be surprised at how affordable our doors are. 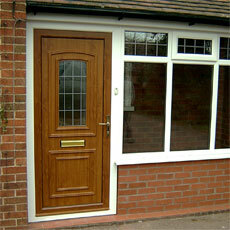 Composite doors are built in a completely different way to our uPVC doors. Combining natural timber with hi-tech synthetic materials, these doors offer security with a fantastic finish. Not only are they built to last, but will offer extra insulation, helping to keep heat in your house and reduce your energy bills. Our composite exterior doors can also be combined with a range of side panels to go either side of your door, with both solid and glazed options. You can also personalise your doors with our variety of letterboxes, handles, knockers, door numbers, spy holes and safety chains. If you want to take a closer look, get in touch for a free quote! A French door is one popular choice for letting extra light into your home as well as giving easy access to your decking or garden. 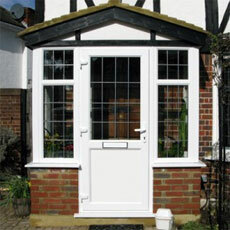 Our UPVC French doors (a.k.a french windows) offer a charming, alluring addition to your home or conservatory. The extensive opening allows unrestricted access to your home as well as maximum ventilation and a practical entry into your garden or patio. Naturally, you still have the same extensive choice of styles and finishes as you have with any of our products, giving you all the stylish looks, durability, weather resistance and low maintenance of modern, top quality PVC-U. 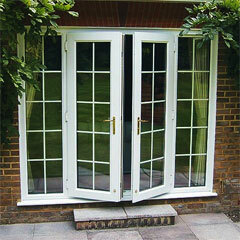 Our French doors are also fitted with toughened glass as standard, for safety reasons as well as security. Our aluminium sliding patio doors will give you a room with a view, literally transforming the look and feel of your home or business. Being made from strong, light aluminium means that our patio doors are slim and provide huge glass areas, while achieving larger maximum sizes. 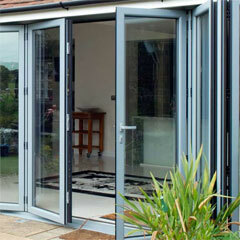 Aluminium sliding patio doors give you more glass and less frame which results in more light being let through. The rooms in your property will seem bigger, brighter and warmer. Sliding patio doors are a bold and charming alternative to French doors, as well as being a simple and cost effective alternative to Bi-folding Doors. 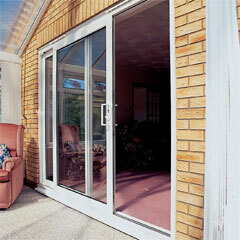 Our patio doors are designed to be secure and come at competitive prices. All our products are made to measure, manufactured to your exact specifications - so why settle for less? Call us today or 01932 807 273 to find out more! Bi-Folding Doors transform a home and commercial building in the way they are used; relax in stylish open plan areas whilst enjoying the full view outside. If you’re working on a design-driven project, bi-folding doors are the doors you need. Aluminium bi-folding doors provide a striking glass facade when they are closed and when open they can stack internally or externally so are less intrusive and make the inside feel part of the outside and vice versa. Our architectural aluminium bi-folding doors add style to domestic projects and enhance aesthetic benefits in commercial designs. Strong, durable and easy to maintain, they will reveal their quality over a lifetime of use. When ordering an aluminium bi-folding door you can be sure it will be manufactured to order in our factory and fitted by one of our expert teams. Your project is important to us and will always receive our very best attention. To discuss your plans for an aluminium bi-folding door in your project, please contact us. 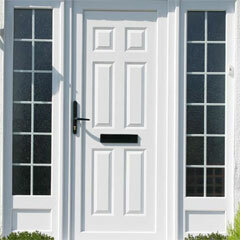 We offer a fast response repair service for all types of doors, including; UPVC, composite, French, bi-fold and sliding. You do not need to of bought the item from us, this service is for everyone! You'll get 20% off if you call us today!